1st thing I did order the plastic as I mentioned yesterday. 2nd thing is I built and installed the arches! Here is what I did, and how it looks. Feel free to critique it. The first picture shows the pvc and how I connected the two 10′ sections. I felt that using a regular 1″ coupler was not going to be strong enough. 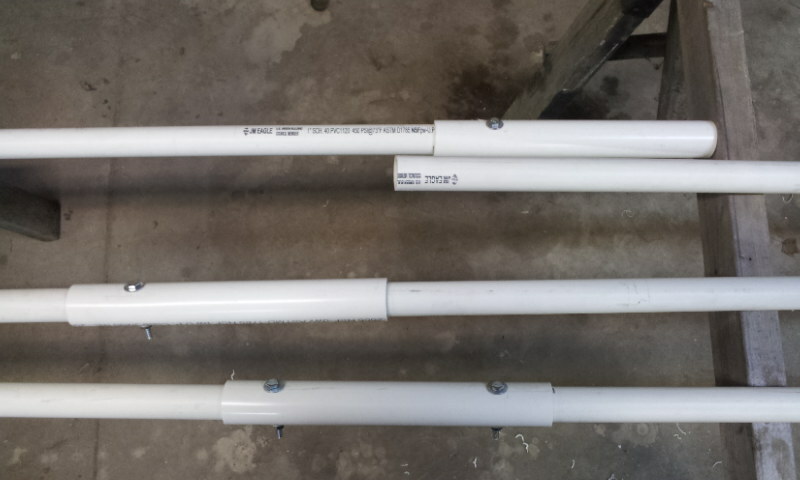 So, I cut a 12″ piece of 1 1/4 pvc to made a new coupler. The 1 1/4 slides over the 1″ perfectly. The top two pieces will slide together and form a single 20′ arch. You can see that I already drilled and put in a bolt. Next the piece under it will be slid in and then drilled for another nut and bolt. The bottom piece is complete. I used 1/4″ x 2 1/2″ bolts. I could have used a 2″ bolt instead. I also put washers on each end. When they get installed I have to make sure that the exposed end of the bolt is facing down so it doesn’t contact the plastic. I made up 9 of these arches. With a span of 3′ that gives me a total length of 24′. 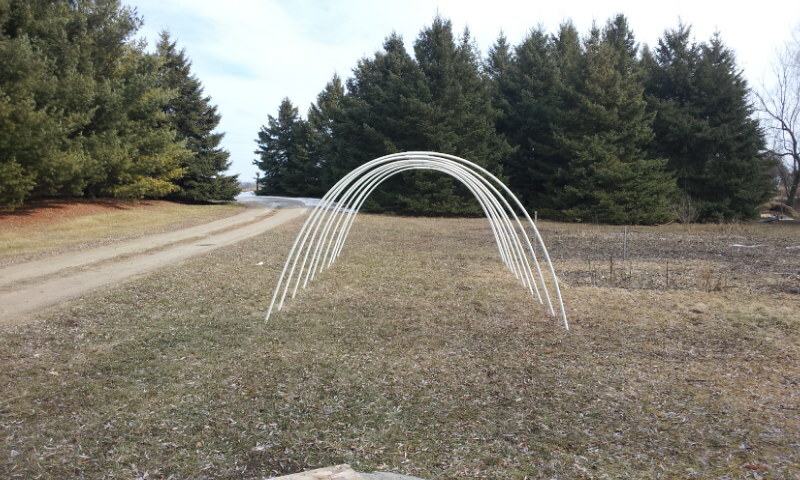 These arches slide over the 1/2″ conduit that is already pounded in the ground. I am facing to the east as I took this picture. 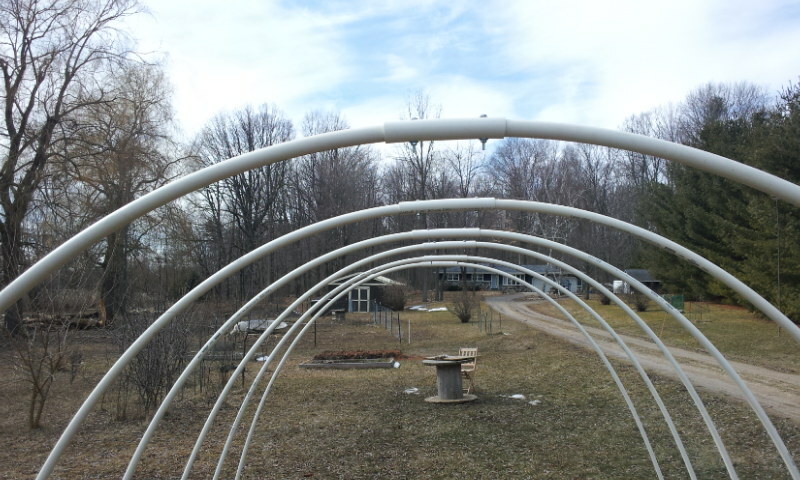 My regular garden is directly south , or on the right side of the hoop house. Here I am looking to the south. You can see that with just the conduit they are pretty stable. I don’t know if I mentioned it earlier, but when I pounded in the conduit I put it at about a 30 degree angle to the piece directly across from it. That makes it a little easier to slide on. I think it will also put less stress on the lower section of pvc. Ok. This is looking back to the west. Here is a close up of how the bolts need to face down so the exposed bolt doesn’t contact the plastic. If you see anything that you think or know will be a problem…PLEASE TELL ME! I will certainly appreciate it. Also, I added the wooden boards. 2 x 6 x 12 treated pine laid vertically on the inside of the arches. The end boards are the same size but they are laid horizontal (flat on the ground). I also cut out a slot so the two pieces would fit together nicely. 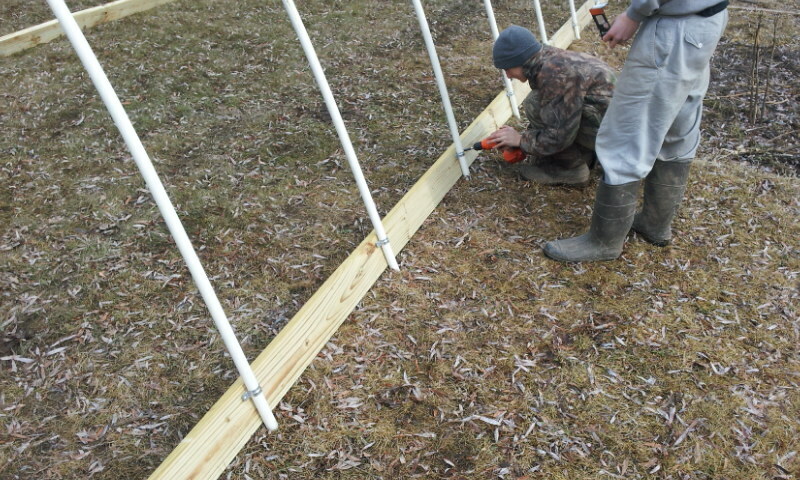 Here the boys are screwing the pvc brackets to the board. I also framed one end for the door. 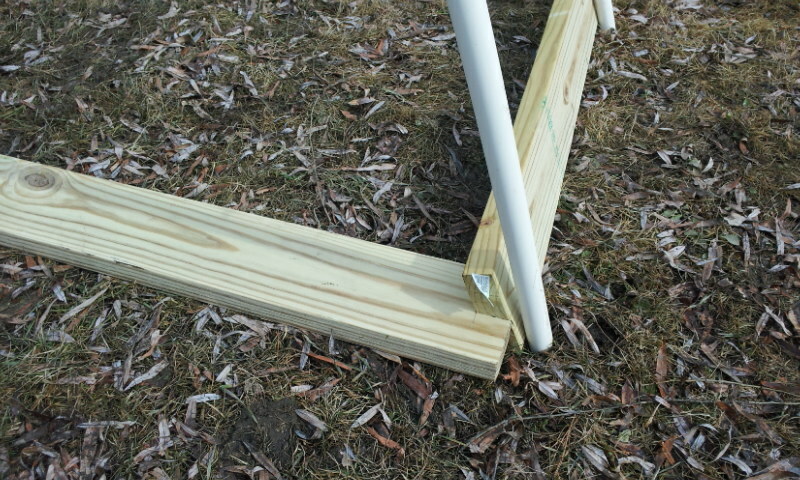 Just plain 2 x 4 studs. I don’t have pictures of that yet. 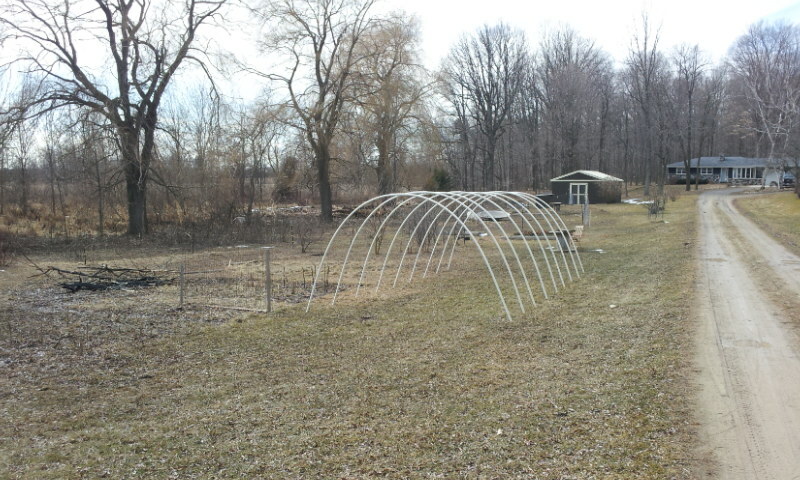 And it snowed so I will not be working on the hoop house for a couple of days. And to top if off, my plastic was delivered today! UGH! The next update can be found here. Your a step ahead of me! Hopefully I will have a post with pics up in a couple of days showing how I am doing it. Basically, the long sides will roll up. 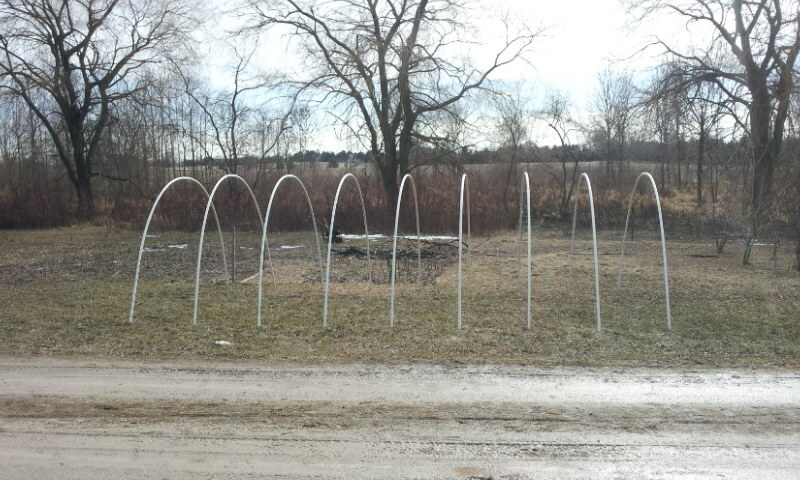 A length of pvc will run the length of the hoop house and the plastic will roll up around it. The short ends will have the plastic pulled down and held in place with some pieces of wood lathe strips. If you just nail the plastic to your frame it will pull out and rip the plastic. Instead sandwich the plastic between your wood frame and lathe strips. If I wasn’t rolling up the sides I would do the same thing as on the short end.